Mac Choice is an Apple Authorised Service Provider. We offer in-warranty and out-of-warranty repairs for all Apple products including Mac, iPhone, iPad, iPod, Apple Watch, Apple TV and Beats. The Mac Choice team includes Apple Certified Technicians who are trained and kept up to date with the latest Apple operating systems and hardware. Our senior technician has over 18 years experience with Apple repairs and together with our onsite spare parts, the backing of spare parts from Apple and third party solutions we can take care of any repair, upgrade or refurbishment. After accepting an iPhone for screen repair it can sometimes be evident that parts other than the screen require replacing. In that case Apple will provide an opportunity to opt out of the repair or continue on and repair the iPhone using the “other damage” prices as per above. All iPad repairs involve replacement of the unit at one flat fee from Apple. 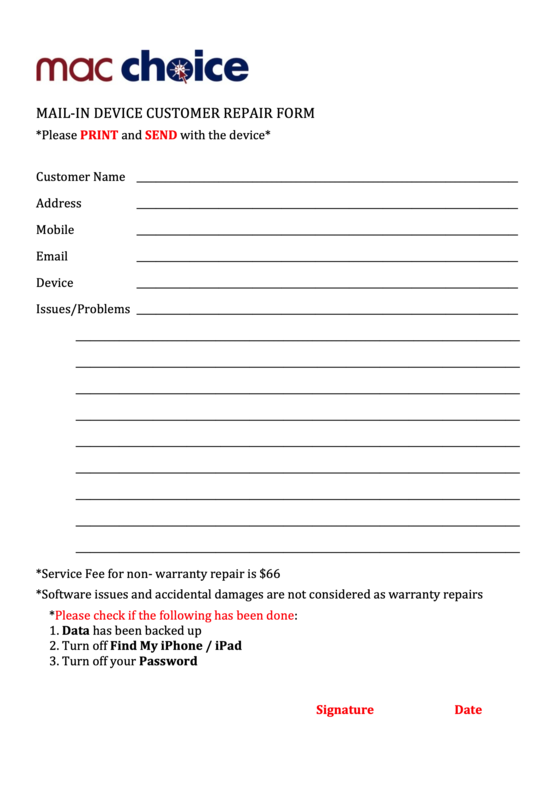 If your iPad is covered by AppleCare+ the screen repair has a standard administrative fee of $65. If AppleCare+ is not applicable then the following rates apply. Help! I broke my iPhone or iPad screen – now what? As an Apple Authorised Service Provider we’re able to offer genuine repair or replacement of iPhones and iPads. Are the repairs completed in-store, and how long will it take? Some types of repairs are completed in-store by our Apple-trained technicians. In Australia (at least for now) screen repairs are performed by Apple using very specialised equipment. We advise that the turnaround time can be up to 7 days. Do I need a screen replacement or Whole Unit Replacement? If the repair involves more than just replacing the screen then a Whole Unit Replacement option is available. For iPads right now there is no screen replacement option available, a whole unit replacement would be required to replace a broken screen. If a device is sent to Apple for screen replacement and the damage is more severe than anticipated the repair can be uplifted to a whole unit replacement, or returned as is. What if I have AppleCare+ ? AppleCare+ is an extended warranty bought when your phone is new. It provides many benefits one of which is advanced replacement of your iPhone for a small processing fee. If we receive the iPhone at Mac Choice in the first half of the day we can usually have the replacement ready to go on the next working day. What if my Device is broken in some other way? Many types of battery, button and antennae repairs can be completed in store using genuine parts. If the device is damaged badly then there’s always the option for a Whole Unit Replacement – where the entire phone is replaced with a refurbished unit. See the pricing in the table above. Is there anything I need to do before I bring my iPhone, iPad or iPod in? Your device needs to be logged out of “Find my iPhone” before we can work on it. If the device is not usable then this can also be accomplished at icloud.com. Also, we know that your device is full of precious data, so please back it up before you bring it to us if you can. I am not able to go to the store, can I send the item via Australia Post or a courier? Yes, you certainly can! Just make sure you pack your device nice and safe and you can post that out to us anytime. We also prepared a downloadable form for you to fill out and send with the device that would make it easier for us to grab your details and what is wrong with your device. I see screen repairs advertised all the time cheaply, why would I bring my iPhone, iPod or iPad to Mac Choice for repair? For sure, we recognise that you have options when considering your repair. Apple provides you with the peace of mind of genuine parts and repair undertaken using the proper equipment and expertise. It stands to reason that whilst there may be some good third party repairers out there, there are also many bad ones. Third party repairers do not have access to genuine Apple spare parts so the quality of replacements screens will vary substantially. Unfortunately we see a lot of repairs that have gone very wrong, and there’s little we can do to help once a non-genuine parts has been used in an iPhone, iPad or iPod Touch. Please be very cautious of a non-genuine repair and make an informed decision as to whether it is worth the risk. If your device is less than 24 months old and still has an Australian warranty then a non-genuine repair may affect some or all of your warranty in the future.